The King James Version of the Bible mentions Easter—but only once! Why do other translations say Passover? Which day should Christians observe? As should be the case, many look to the Bible as their main source for guidance on how to please God, including on the subject of Easter. But among these well-meaning people are many who wrongly assume that the ending of the Old Covenant also ended every law associated with it. They have been led to believe that the “old law” was replaced with a new standard—heralded by Jesus Christ at His death. This is a major part of the thinking that has led so many to mistakenly assume that Easter has replaced Passover. For proof that Easter is the observance for Christians, some cite the King James Version of the Bible in which one New Testament verse mentions “Easter.” Let’s look at this verse and see what it really says. “And when he had apprehended him, he put him in prison, and delivered him to four quaternions of soldiers to keep him; intending after Easter to bring him forth to the people” (Acts 12:4, KJV, emphasis added throughout). In the 1611 version of the King James Bible, this is the only verse where “Easter” is used. William Tyndale’s translation is even older, completed in 1522, and he used “Easter” in many New Testament verses. Yet most modern translations do not use “Easter” in any verse! What is the controversy surrounding this word, and why do almost all modern translations say “Passover” if Easter is truly the day Christians should observe? Let’s start by looking at the original Greek word that the early translators had to translate into English. The Greek New Testament uses the word pascha or πάσχα in this verse. What does pascha mean? How was it viewed by the scholars King James assembled to produce his English translation? Long before Tyndale’s Bible, translators working in Alexandria in the third century began translating the Old Testament Scriptures into Greek. When they came to the Hebrew word pesach or פֶּ֥סַח, there was no equivalent word in Greek. The Greeks never observed the Passover, and therefore didn’t have that word in their language. To avoid mistranslating it, the scholars transliterated it into a Greek form of the original Hebrew. To transliterate means “to transcribe (a word, etc., in one alphabet) into corresponding letters of another alphabet” (Collins English Dictionary, 2003). In other words, it is not a translation, but a representation in another alphabet. In this case, it was changing the letters for the Hebrew פֶּ֥סַח (pesach) into the corresponding Greek letters to arrive at πάσχα (pascha). Many early translators of the Bible into Latin and English chose to use the word Easter instead of the word Passover. Nearly a century before the King James Version, Tyndale started his translation of the New Testament from the Greek, which included pascha, the transliteration of pesach. When he came across this transliterated word, he chose not to transliterate it in English. Because the season of the Passover was near the time of Easter, Tyndale opted to use “Easter,” even though he knew there was a significant difference between these festivals. 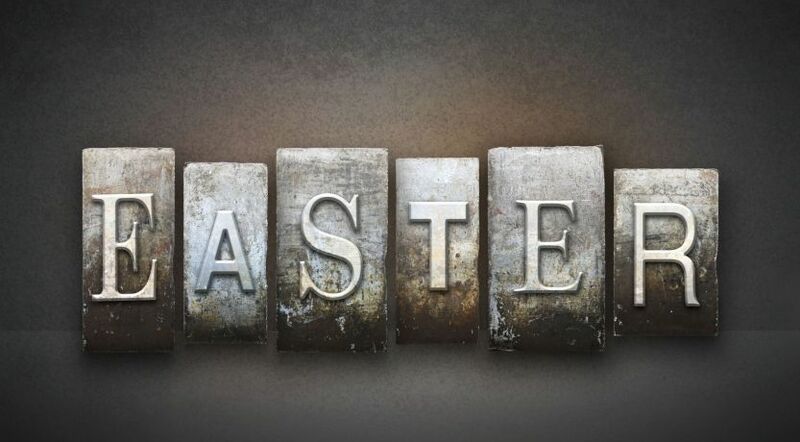 This Greek word pascha occurs 29 times in the New Testament, and Tyndale translated this word as Easter 14 times; esterlambe (Easter Lamb) 11 times; paschall lambe (Passover Lamb) three times; and esterfest (Easter Festival) once. Tyndale translated the Old Testament after translating the New Testament. In working with the Septuagint, the Greek translation of the Old Testament, he was again faced with this same word, pascha. Inconsistent with his work on the New Testament, he opted for a new word in English, Passover, to be used in all cases in the Old Testament. Passover truly is more accurate, for it is the meaning of the original Hebrew. Why did the translators of the King James Bible translate as Passover all 28 other occurrences of pascha in the New Testament except for this one verse, Acts 12:4, where they translated it Easter? Why didn’t they translate it as Passover here too? Many scholars in researching this puzzling question conclude that it must have been an oversight, and that it would have been changed if it had been caught prior to printing. Nearly every scholar today understands that the early New Testament Church kept the Passover and not the modern holiday observance of Easter. Albert Barnes wrote in his commentary: “There never was a more absurd or unhappy translation than this. The original is simply after the Passover, meta to pasca [μετα το πάσχα]. The word Easter now denotes the festival observed by many Christian churches in honour of the resurrection of the Saviour. But the original has no reference to that; nor is there the slightest evidence that any such festival was observed at the time when this book was written. The translation is not only unhappy, as it does not convey at all the meaning of the original, but because it may contribute to foster an opinion that such a festival was observed in the time of the apostles. “The word Easter is of Saxon origin, and is supposed to be derived from Eostre, the goddess of love, or the Venus of the North, in honour of whom a festival was celebrated by our pagan ancestors in the month of April (Webster). As this festival coincided with the Passover of the Jews, and with the feast observed by Christians in honour of the resurrection of Christ, the name came to be used to denote the latter. In the old Anglo-Saxon service-books the term Easter is used frequently to translate the word Passover. In the translation by Wicliffe [Wycliffe], the word paske, i.e., passover, is used. But Tindal [Tyndale] and Coverdale used the word Easter, and hence it has very improperly crept into our [King James Version] translation” (Albert Barnes’ Notes on the Bible, 1798-1870, comments on Acts 12:4). The New King James Version of the Bible was translated over a period of seven years and was completed in 1982. The publishers wanted to preserve the beauty and literary style of the original King James Version. But the NKJV translators wanted to make necessary corrections in vocabulary and grammar too. They and most other modern translators recognize that “Easter” was an inaccurate translation of pascha in Acts 12:4, and they use the word Passover instead. Rather than supporting the Christian observance of Easter, Acts 12:4 corroborates the other 28 uses of the word pascha in the New Testament to show us that the early Church of God observed the Passover. The 29 references cover the span from Christ’s death through the later writing of the apostle Paul. It is abundantly clear that the New Testament Church of God observed the Passover—not Easter! Did you know that this was Jesus Christ’s teaching and that neither He nor the early Church observed Easter? Do you know why modern Christianity observes Easter instead of what Jesus did and taught? Are you aware of the fact that there are more festivals God commanded, which are just as significantly different from modern Christian holidays as Passover is from Easter? The answers might surprise you!